The Citizens United ruling now allows wealthy individuals to funnel unrestricted amounts of money into political action committees and essentially purchase a candidate to make any of their dreams come true. Exposing this egregious oversight with accessible humor is an affable attempt to rile the unsuspecting audiences, and The Campaign seems to foot that bill. Featuring two recognizable and trustworthy comedy stars to expose this over-reaching Supreme Court ruling, and without over-staying its welcome, The Campaign successfully balances humor and politics better than Al Franken. A repeated number of scandals has brought North Carolinian Congressman Camden “Cam” Brady’s (Will Farrell) poll numbers down below fifty percent, yet he still runs unopposed for the upcoming election. Glen and Wade Motch (John Lithgow and Dan Aykroyd respectively) have chosen to put their unrestricted wealth behind another candidate that can assure continued deregulation to fuel their continued profitability. They choose Marty Huggins (Zach Galifianakis), a local Hammod, NC tourist guide and bumbling but charming Southern family man. Huggins’ campaign is entirely managed by the Motch Brothers’ personnel and proves to be a formidable opponent for Brady. The Campaign has no shortage of laughs for spectators across a variety of political exposure. 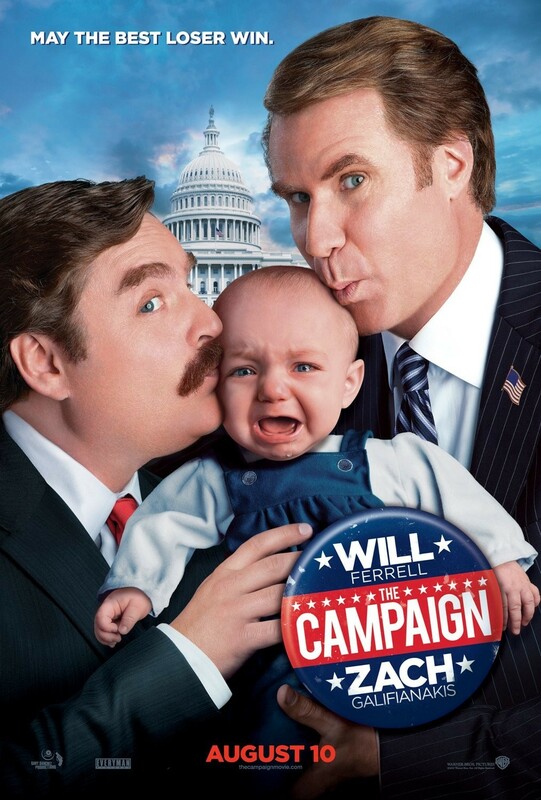 The crude humor is equidistant from the political satire, yet both the gags and over-reaching themes have a timelessness to them that should help the film find a loyal audience beyond the theater, even if baby punching, animal cruelty, and political infidelity are easy chuckle-provoking targets. Although Camden has had years of riding high as a corrupt Congressional representative, his interest in politics has began at an early age. He fought to have a dilapidated slide that had been harming children removed and torn down a la Saddam Hussein’s Iraq statue. Despite the thousands of candidates who have that one schoolyard slide story, that one moment to relate to their constituents that they fight for the common good, they have been bought or given in to corporate and lobbyist interest. Just past the half-way mark, the Motch Brothers take a turn on their financial backing after the clueless Marty finds himself to be a patsy and pawn. This about-face matches the erratic 24-hour media coverage bent on finding an angle in every public address or comment. Brady and Huggins are both running as conservative Republicans, but the film exposes how easily it is for these candidates to become the puppets of a greater force. While it certainly exposes a dark threat hanging above our nation’s consciousness, The Campaign falters when it attempts to drive home the lessons of standing up to campaign financiers who wish to own members of Congress. Director Jay Roach is no stranger to political comedy. His previous films have included Game Change and Recount, and has enjoyed success with the Austin Powers franchise and the first two Meet the Parents films. Yet, the theme of power and money hungry executives controlling unsuspecting buffoons has become a more recent signature, especially with Roach’s Dinner for Schmucks. Having both Farrell and Galifianakis as the headline talents is a dream come true for fans of the modern comedy scene. Farrell dons a near-replica of his SNL-era Bush persona to explore the anything goes attitude that politicians exhibit to keep their jobs. Galifianakis evokes the hopes and dreams for an unassuming family and religiously oriented candidate to rise above mediocrity and maintain his hokey demeanor. Dylan McDermott arrives on screen at the most opportune times for a quick laugh as he constantly monitors, shadows, and instructs Marty’s campaign. He hilariously embeds himself into the Marty’s life; hiding in the backseat, around the corners, and even eating breakfast with Marty’s family. More crude than smart, The Campaign missed a fantastic opportunity to really drive this political satire into a more biting commentary. As our country’s election campaigns become more negative and backed by unrestricted financial resources, the voice of millions can be easily quashed by a select few. The obvious links to the Koch Brothers via the film’s Motch Brothers represents legacy that the Citizens United Supreme Court ruling has brought upon this country. If this collective of talent can successful bring such real threats to the consciousness of audiences with humor, we can consider that a victory for all parties involved.